This family of shrubs and twining lianas (and one genus of perennial herb) is found in mid-latitude temperate climates- North as far as Canada/ Southern Russia and South to Mexico, Northern Africa, and Central China. The Caprifoliaceae comprise the “CAP” in the “MADCAPHORSE” memory trick for woody plants with OPPOSITE leaves. In general, flowers in this family are “PERFECT” (bisexual), EPIGYNOUS (inferior ovary), 5-MEROUS, have small sepals, and a gynoecium of 2-8 fused carpels (SYNCARPOUS). From there, the family splits broadly into two groups: (1) those with ENTIRE leaf margins and irregular, BILABIATE corollas in few-flowered AXILLARY clusters that produce BERRIES (e.g. 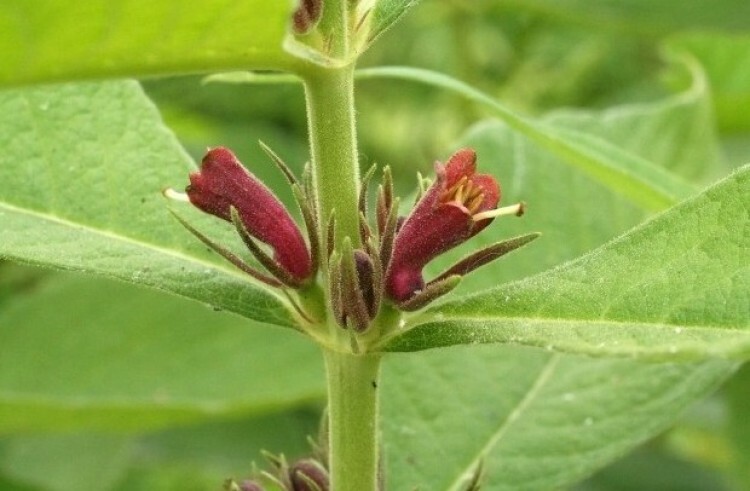 Lonicera, Diervilla) and (2) those with TOOTHED leaf margins and REGULAR corollas in terminal many-flowered cymes that produce DRUPES (e.g.Viburnum, Sambucus). 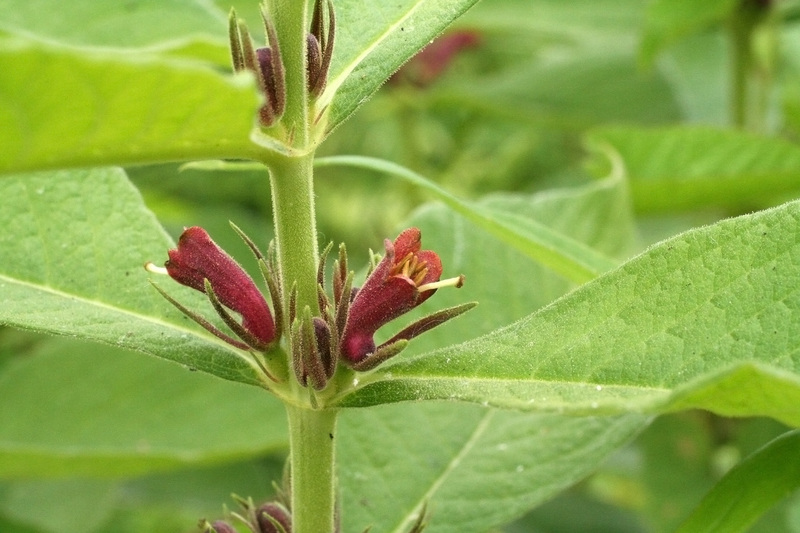 Many members of this family possess nectaries at the base of their flowers to attract pollinators. 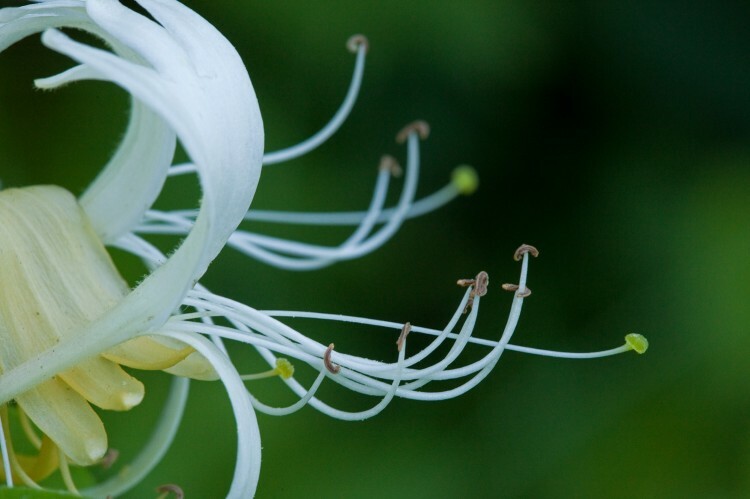 In addition, the flowers often emit a sweet heavy odor. 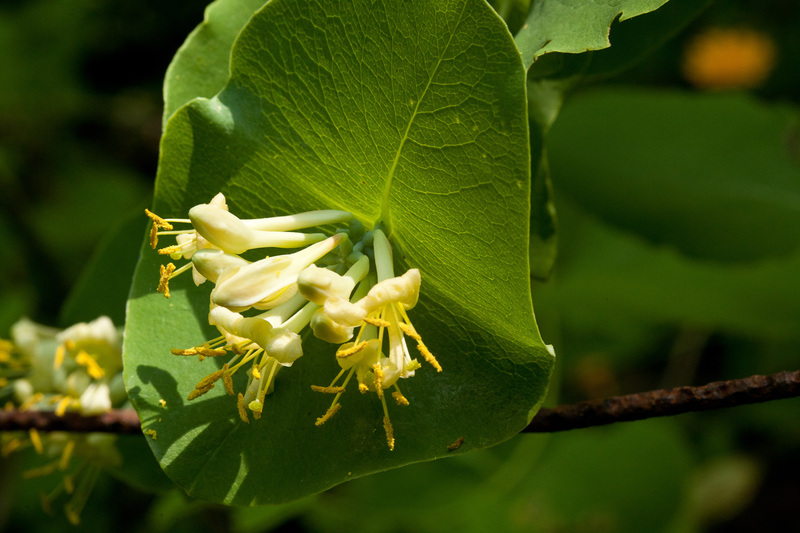 Although this family boasts some fine native woodland shrubs, including snowberry and coral berry (Symphoricarpos spp. 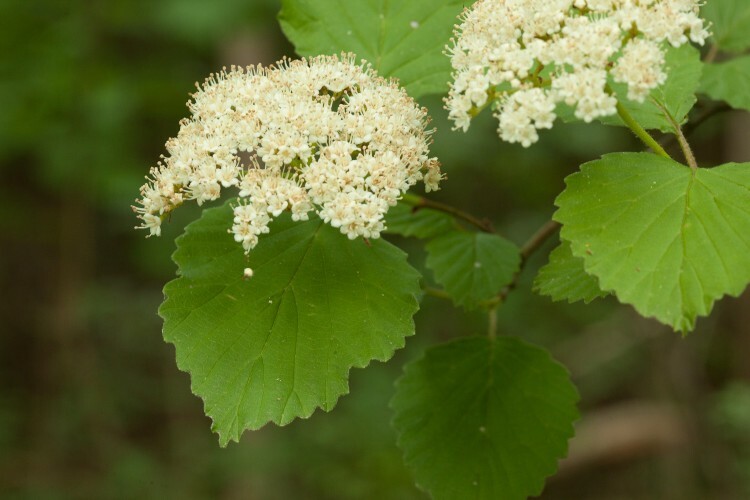 ), nannyberry (Viburnum lentago), blackhaw (Viburnum prunifolium), arrow-wood (Viburnum dentatum), and elderberry (Sambucus canadensis), it also contains two of the top ten invasive plants listed on the ODNR’s website (Top 10 Ohio Invasives). Viburnum prunifolium in flower in May. Mouse over to see the developing fruit. What type of fruit is that again? Small, fused sepals are characteristic of the family Caprifoliaceae. Can you see the 5 sepal lobes and the glandular peduncle? 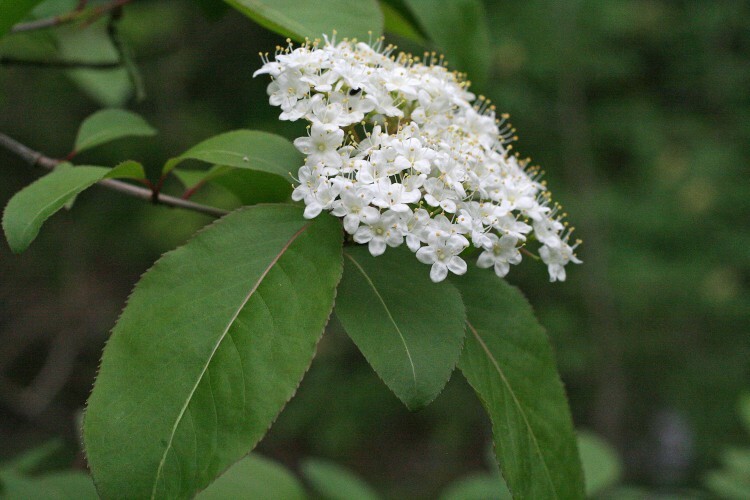 Viburnum acerifolium in flower in May. 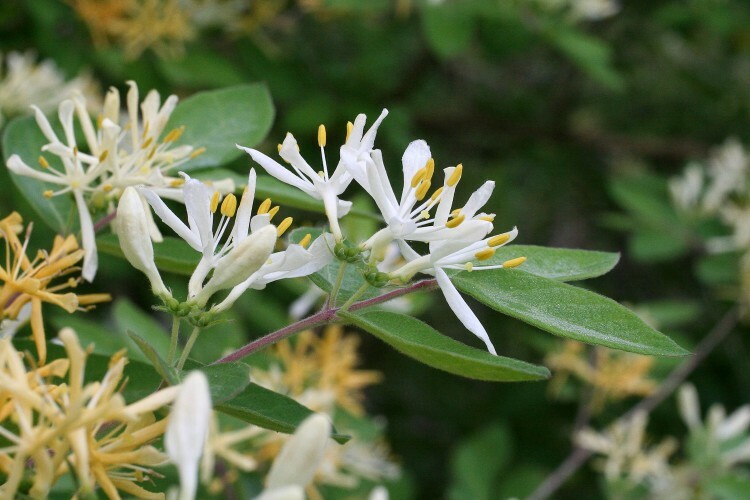 This squat woodland shrub has fuzzy maple-shaped leaves (as its name suggests). 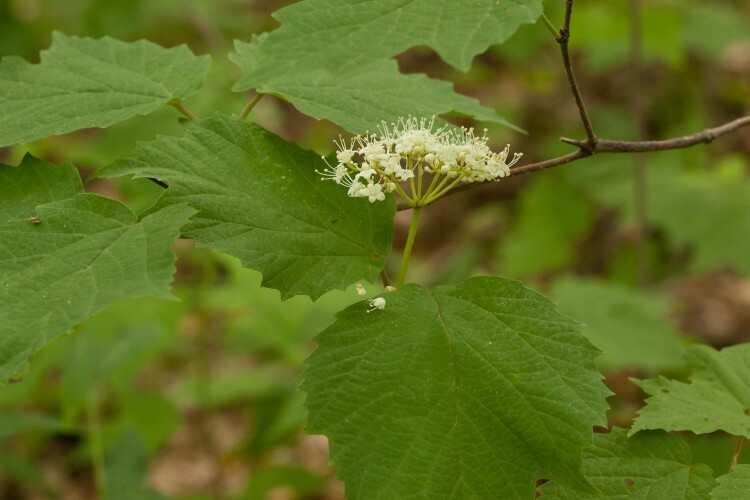 Watch out for its widespread obnoxious look-alike, high-bush cranberry (Viburnum opulus), which has glabrous leaves with shorter, more spreading lateral lobes. Viburnum dentatum in flower in May. Mouse over to see the immature fruits one month later. 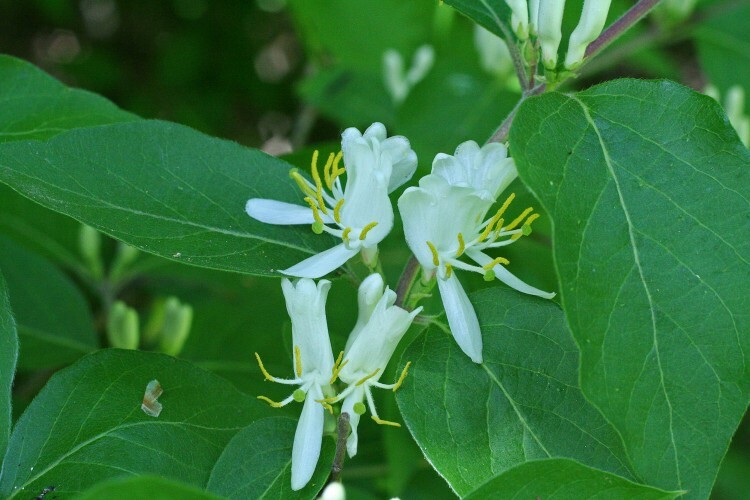 Enemy #1: Lonicera maackii (Amur honeysuckle). This highly successful shrub leafs out earlier than its competitors and puts pairs of red berries like they are going out of style (mouse over to see the fruit). Leaves are longer, less hairy when mature, and more attenuate at the tips than L. morrowii. 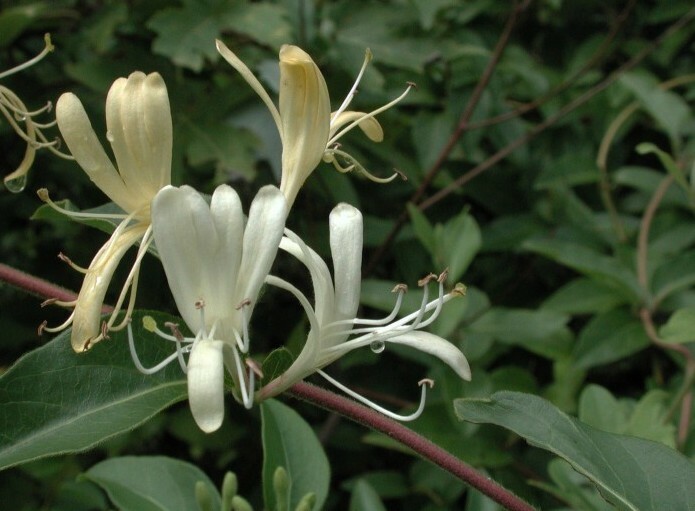 A second bush honeysuckle, L. tatarica, is similar to L. morrowii, but the flowers are pinkish instead of white, becoming yellow with age. The Lonicera hybridize readily, so the boundaries between similar species are sometimes unclear. Like L. maackii grows in open woodlands and riparian habitat. L. japonica is similar to the bush honeysuckles in flower, but not in growth habit. This twining vine competes with poison ivy for control of the forest floor in Southern Ohio. Has waxy leaves that appear almost evergreen, and margins may be entire or lobed like a white oak. L. reticulata, or grape honeysuckle, has distinctive perfioliate connate leaf attachment. it seems to be more common in Southern Wisconsin and Northern Illinois. The Caprifoliaceae contain two other noteable genera: Triosteum and Sambucus. Triosteum perfoliatum is one of three Ohio species of this herby genus. All are upland dioecious perennials. Sambucus canadensis with flower and developing fruits in separate cymes on the same plant. 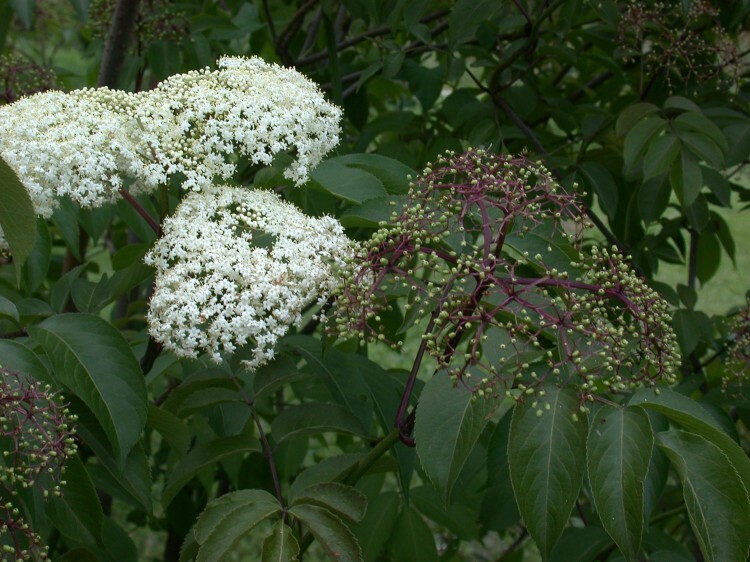 Sambucus, aka elderberry, is a small tree that grows in thickets in wet forest openings. What makes it so different from other genera in this family? Why take a closer look and you will discover that it has compound leaves, with shiny serrate leaflets and purple petioles! The abundant purplish-black fruit that ripens in August is bitter to the tastebuds and anthocyanic to your fingers. However, it is usually FREE in rural areas! Locate your intended prey (make sure it’s not on park/protected lands) and wait patiently until late summer. If you pick them too early, they will taste even worse than when they are ripe. Remember, the birds are less picky than we are; they will begin helping themselves when the berries are barely purple! Equip yourself with rubber boots, a 5-gallon bucket or several peck baskets, a pair of scissors, and some bug spray (optional). Cut the entire cyme of ripe fruit off the tree and place in bucket. Repeat. Place entire bucket in the freezer for a few hours to kill bugs (yes, Hemiptera are especially fond of the berries) and to make them easier to shuck. Shuck the berries from the stems outside, over a sheet, or in the garage, as they will stain whatever they come in contact with. Over a clean bucket or large bowl, hold the peduncle in one hand and pull the berries from the stems with the other. Discard stems. That nice full 5-gallon bucket plus 1 hour of shucking will yield approximately 2 quarts of berries. A lot of work for little reward. Turn the berries into a crunchy (lots of small seeds) fruit pie or strain the juice off for jelly. For best results, ferment into wine or brandy! 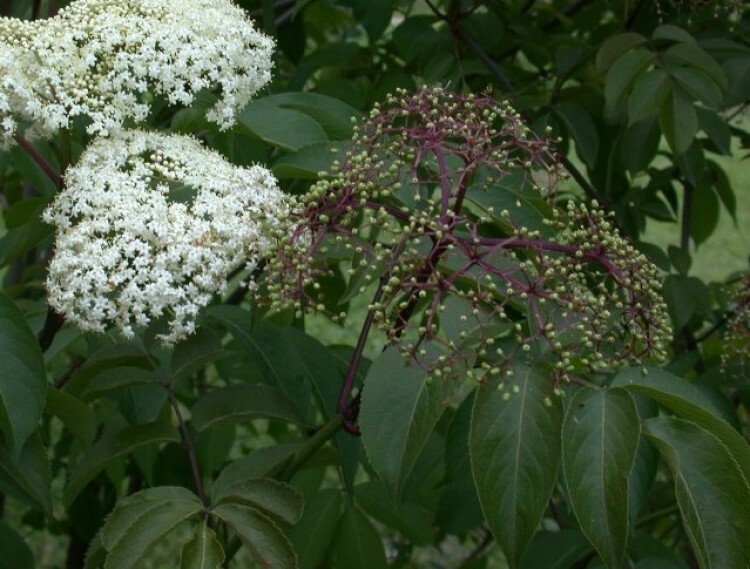 Like many “edible” plants, elderberry is not without defense against herbivores. The berries contain small amounts of cardiac glycosides, a family of secondary plant metabolites that can cause cardiac arrest if eaten raw in large quantities. 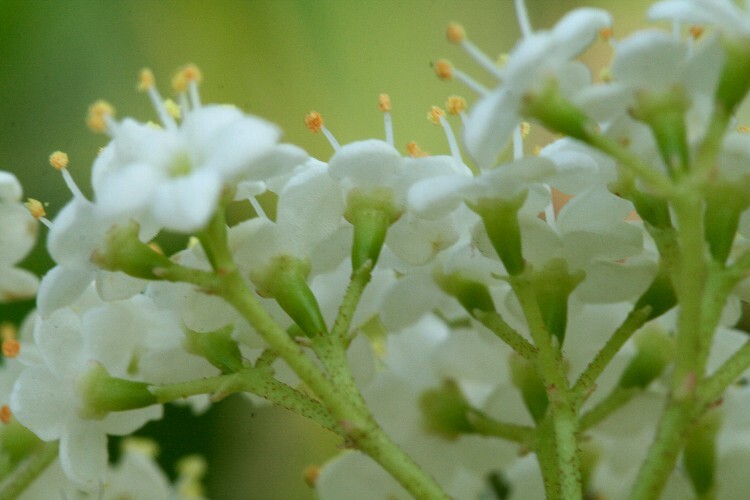 Taxonomy Alert: Viburnum and Sambucus are sometimes placed in a different family, the Adoxaceae, because they lack nectaries at base of their corollas, the fruit is a drupe with 1-5 small stones, their corollas are short styled, they have large chromosomes, and they produce small reticulate pollen grains.